The Church of Scientology Choir performing at the Scientology Information Center on November 4th. The choir’s next performance at the Information Center will be Christmas caroling on December 1st in Charles Dickens themed attire. CLEARWATER, FLORIDA, USA, November 8, 2018 /EINPresswire.com/ — On Sunday Nov. 4th, the Church of Scientology Choir performed a musical showcase at the Scientology Information Center in downtown Clearwater. Guests clapped along to well-known favorites crossing several genres and decades. The Church of Scientology Choir originated in the United Kingdom in the 1960’s where early Scientologists put the concepts of their religious beliefs to song in celebration of their spiritual advancements. The Clearwater chapter of The Church of Scientology Choir was formed in 1993, in continuation of that tradition. 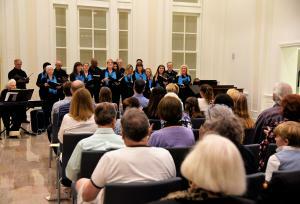 The Choir’s next performance at the Scientology Information Center will be on December 1st between 6-8pm. The Scientology Information Center is open daily from 10 am to 10 pm. For more information about the choir’s next performance please contact Amber Skjelset, Manager of the Scientology Information Center at (727) 467-6966 or email amber@cos.flag.org. For more information on Scientology, visit www.scientology.org or the Scientology Network on DirecTV channel 320, or streaming at www.scientology.tv or apps at AppleTV, fireTV, and ROKU. The Scientology Information Center, located in the century-old Clearwater Building in downtown Clearwater, opened on July 11, 2015, and currently houses a gallery of audiovisual displays with some 400 videos. The Center is open to all and provides a self-guided tour showing basic Scientology beliefs, Churches around the world, ongoing social programs and the life of L. Ron Hubbard, Scientology's founder. The Center offers tours to the broad public and civic leaders; holds concerts, theatrical performances, and receptions for the community; and opens up the use of its conference room to social, civic and non-profit groups.